Order one set per vehicle. 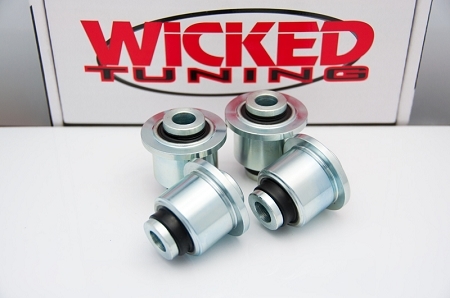 Wicked Tuning continues to deliver the same superior quality in S2000 rod ends and mono-ball spherical bearings as they do for the early model Civic's, Integra's and CRX's. Increased spring rates, race compound tires and spirited driving can create excessive suspension deflection of the OEM rubber control arm bushings. Hard braking and cornering add stress to the compliance bushing and causes premature wear. A simple way to tell if you have worn compliance bushings is to inspect for creases, cracks or tears within the bushing. The compliance bushing is located where the lower control arm meets the pick-up point at the sub-frame. It is the only pickup point in the front suspension where the adjustable eccentric bolt is vertically oriented. Wicked's Upper Control Arm Bushing eliminates suspension deflection and other forces that tend to cause unpredictable shock & control arm movement. Less unpredictability, more suspension response and feedback.